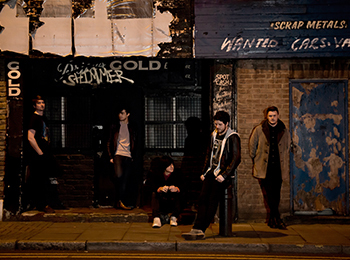 East London 5-piece, Dexters, today announce the release of their debut album ‘Shimmer Gold’, out March 17th through Acid Jazz Records preceded by the single Recover, released on March 10th. Groups of good time boys and girls, musicians and renegades, vampires and vagabonds throughout the country are rooted in the same, unenviable and rudimentary limbo, frantically scheming, delicately lock-picking and audaciously plotting for the next strike for gold. Dexters have the master keys to that lock. They stole, or in fact borrowed them from the caretaker of a ramshackle school for young tearaways in the rough part of East London they grew up in, a place that feels a million miles from the chattering of the yuppified Hoxton bars just around the corner. This month they embark on their own extensive UK tour previewing tracks from ‘Shimmer Gold’, including their biggest London show to date at The Garage. Tickets are available from their website. Like Dexters on Facebook & follow them on Twitter.